General Mills, Big Machine Label Group and Feeding America have teamed up for the second year in a row to Outnumber Hunger in a national initiative that helps fight hunger in local communities. The Band Perry serves as the face of the Outnumber Hunger campaign and will appear on specially marked General Mills products, including Wheaties, Cheerios, Yoplait and Nature Valley. New this year, the initiative will kick-off with an Outnumber Hunger Live! concert, complete with a star-studded roster of country artists headlined by The Band Perry, the face of this year’s Outnumber Hunger campaign. Outnumber Hunger programs have helped Feeding America secure more than 12 million meals since March 2012. According to the USDA, one in six Americans struggles with hunger, making the issue a growing reality in every community. By simply entering codes from specially-marked General Mills products, including Cheerios, Yoplait and Nature Valley, at OutnumberHunger.com, Americans can help Feeding America secure five meals for their local food bank. 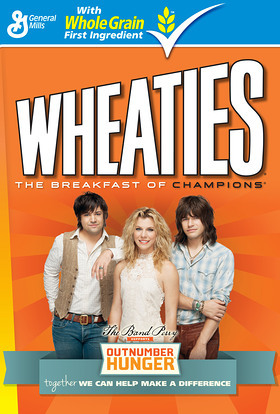 Consumers should look for specially-marked packages of General Mills products featuring The Band Perry, as well as an Outnumber Hunger code. For every code entered online by March 1, 2014, General Mills will donate $0.65 to Feeding America – enough to secure five meals on behalf of local food banks – up to a maximum total donation of $1,300,000. General Mills has already donated $700,000 and will donate up to an additional $600,000 based on online code entry and other consumer actions. The Band Perry, Brantley Gilbert, Justin Moore, Greg Bates, Cassadee Pope and Florida Georgia Line will play a special concert to raise awareness for Outnumber Hunger, Outnumber Hunger Live!, on Friday, April 5 at The Orleans Hotel & Casino in Las Vegas as part of The Academy of Country Music ACM EXPERIENCE, a three-day music event leading up to The 48th Annual Academy of Country Music Awards. Concert attendees will have the opportunity to help Feeding America secure meals through special on-site activities. Additional Big Machine Label Group artists who are encouraging participation include Multi-Platinum-selling superstar artists Rascal Flatts and Reba, as well as Eli Young Band, The Mavericks, Thomas Rhett, RaeLynn, Ella Mae Bowen and Jackie Lee. Outnumber Hunger products will be available first at Sam’s Club on March 12 and then available wherever General Mills products are sold starting in April. Twenty General Mills brands will participate. Entering on-pack codes at OutnumberHunger.com helps Feeding America secure five meals on behalf of a local food bank. Participants enter their ZIP codes to support food banks in or near their area. 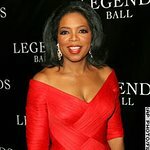 To help make a difference in your local community with Outnumber Hunger, visit www.OutnumberHunger.com.